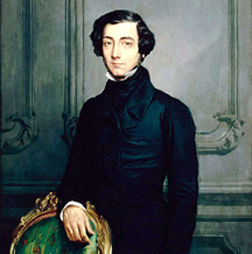 I have been reading over Alexis de Tocqueville’s September 1848 speech on socialism, which he gave before the French Parliament. I cannot resist sharing another excerpt of it here. As Americans we should be proud of the fact that Tocqueville had such high regard for American democracy. We should also be saddened at America’s slide away from the principles that once made her great. This is true because, collectively speaking Americans have made too many poor choices. The U.S.A. is now, without a doubt, on a path towards less individual freedom, more state control and national bankruptcy. We have a national administration that picks and chooses which laws to enforce, thus destroying that sound principle that the United States is a country governed by laws rather than a country governed by the whims of our temporary leaders. The belief system that has poisoned the minds of so many Americans – Socialism – is at the root of many of our current national problems. I look for democracy where I have seen it, alive, active, triumphant, in the only country on earth where it exists, where it could possibly have been established as something durable in the modern world—in America. There you will find a society where social conditions are even more equal than among us; where the social order, the customs, the laws are all democratic; where all varieties of people have entered, and where each individual still has complete independence, more freedom than has been known in any other time or place; a country essentially democratic, the only completely democratic republics the world has ever known. And in these republics you will search in vain for socialism. Not only have socialist theories not captured public opinion there, but they play such an insignificant role in the intellectual and political life of this great nation that they cannot even rightfully boast that people fear them. (In America) you will find a society where social conditions are even more equal than among us; where the social order, the customs, the laws are all democratic; where all varieties of people have entered, and where each individual still has complete independence, more freedom than has been known in any other time or place; a country essentially democratic, the only completely democratic republics the world has ever known. America today is the one country in the world where democracy is totally sovereign. It is, besides, a country where socialist ideas, which you presume to be in accord with democracy, have held least sway, the country where those who support the socialist cause are certainly in the worst position to advance them I personally would not find it inconvenient if they were to go there and propagate their philosophy, but in their own interests, I would advise them not to. No, gentlemen, democracy and socialism are not interdependent concepts. They are not only different, but opposing philosophies. Is it consistent with democracy to institute the most meddlesome, all-encompassing and restrictive government, provided that it be publicly chosen and that it act in the name of the people? Would the result not be tyranny, under the guise of legitimate government and, by appropriating this legitimacy assuring to itself the power and omnipotence which it would otherwise assuredly lack? Democracy extends the sphere of personal independence; socialism confines it. Democracy values each man at his highest; socialism makes of each man an agent, an instrument, a number. Democracy and socialism have but one thing in common—equality. But note well the difference. Democracy aims at equality in liberty. Socialism desires equality in constraint and in servitude. Will Americans be foolish enough to elect a socialist to be the next President? Time will tell. A vote for Hillary, or Bernie or perhaps any national Democrat running for President will be a vote for more socialism. That is really what Hillary Clinton meant by her euphemism “It takes a village.” These people simply do not believe in the sanctity of the individual. To them, “the people” are just cogs in a gear that powers the machine of their personal ambition. Thus, they seek to place individuals in groups and conjure up grievances that do not exist or are highly exaggerated. These groups are told they are victims ( for instance the “War on Women”) and that Hillary or Bernie or Joe or Obama is needed to step in in order to right the wrongs of their victimhood. This is how the unscrupulous politician rises to his or her position of power. These propagandists pit Americans against one another and all the while America continues to decline, structurally, spiritually, morally and economically.